Beginnings. . . The Holy Resurrection Church in Lebanon is the Serbian Orthodox Church’s second oldest in the United States. 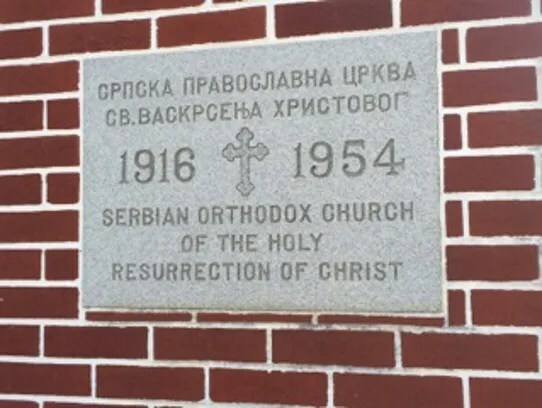 It was consecrated on October 19, 1916 built by the local Serbian community that emigrated here from Serbian lands in the early 1900s in hopes of finding a better life. They were attracted to Lebanon and other central Pennsylvania towns at the turn of the 20th Century, not only because of the jobs in the steel and coal industry but because the rolling hills and rivers reminded them of their homeland. With faith playing a central role in their lives, the congregation decided in the spring of 1915 to build a place of worship, and 18 months later, the close-knit community had its own church, social hall and parish house. Many families had to take out mortgages on their homes, so all three buildings could be built at the same time. The unpretentious church – renovated with a red brick facade in 1954 – may look ordinary from the outside, but inside it is literally a priceless work of art. Its’ walls and ceiling are adorned with frescoes painted in 1918 by Serbian artist Svetozar Popovic, whose works hang in the Louvre in Paris and other museums. In October, 2016 the Lebanon Parish celebrated its gala centenary. 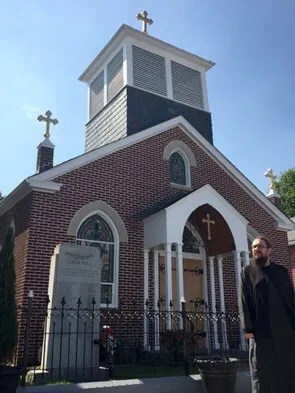 Welcome to the Holy Resurrection of Christ Serbian Orthodox Parish of Lebanon, PA. A community of Orthodox Christians gathered together from diverse backgrounds, united in the Love of Jesus Christ into one faith, we assemble to worship God through daily prayer, weekly services and annual festal celebrations. This parish is dedicated to promoting the Good News of our Lord, God and Savior Jesus Christ in worship, education, stewardship and outreach. We welcome you to join in praising God with us! I came across your website recently and was very impressed. Well done! Seeing the photos brought back many early memories of growing up in the church. My grandparents, Steven and Velinka Gerasinovich, were active members of the church. The church still looks beautiful. Thank you for your work. Looking forward to seeing an update after the 100th anniversary. Thank you Patricia! God bless you! You are always welcome to come over and visit us. We’ll celebrate Christmas (Serbian Bozic, acording to the Julian Calendar) on Jan. 7th. The Holy Liturgy starts at 10 am. Greetings Father Borjan! We would like to prepare for confession and communion the week of the December 11. Can you share with me the days and time of services? Hi Dean! You are always welcome. I should be available after Vespers service (after 6:30pm) on Friday(15th) and Saturday (16th). Let me know if this is a good time for you as well. I am Fr.John Ealy and Orthodox priest in Florida (retired). I am a priest of the OCA. I grew up in Lebanon and knew many of your parishioners as a child growing up. I left the Roman Church and became Orthodox a later a priest. After I retired I served Liturgy on Sunday for your parishioners frequently on my visits to Lebanon during the period that they did not have a priest. I would call Fred Pentelich and ask if they had a priest for Sunday, if not I served Liturgy for them. I also served with two of the priests assigned there when I visited Lebanon. I have always had a special place for that parish in my heart because it played a part in my journey to the Orthodox Church. I pray that Holy Resurrection continues to grow and be a witness for the Orthodox Faith in Lebanon. Convey my greetings to those who remember me. Dear Father John, Christ is in our midst! You are always welcome to visit us. It will be our blessing to have you among us and, God willing, to serve together the Divine Liturgy.